Private outdoor hot tub, Fishing boat and motor, canoe, huge sheltered deck with heater with audio entertainment system, enormous Dock that handles up to a 30 foot vessel (bring your boat), a safe sandy beach, sleeps 8 comfortably, 2 bathrooms and easy access to dozens of local attractions. The family fun Log cabin rental 1.5 hours from Toronto. During the summer months you will find multiple places to golf close by. Georgian bay boasts some of the best bass fishing in North America. Giants Tomb is a short 20 minute ride by boat. The Georgian Queen is moored right across from the cabin at the town dock. You can cross country ski right on on the bay. For those in the family that are not skiers can stay and relax in comfort or try the great ice fishing right out front of the Cabin. Like to Snowmobile? The snowmobile trail system is just 2 km away and better than that, you can jump on the bay right from the shore line and travel up the lakes. Rent a log cabin on Georgian Bay in Ontario. 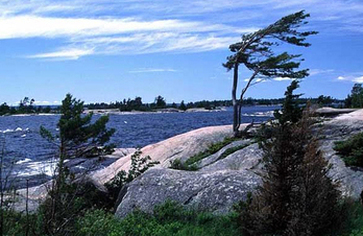 At LogCabinRental.Ca, you'll find the best of Georgian Bay. This is a year-round cottage. 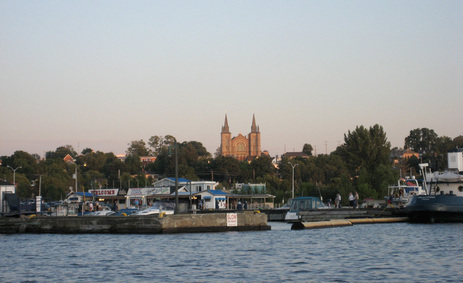 Only minutes away by boat is the 30,000 Islands and 3 minutes by car or boat is down town Penetanguishene. This log cabin location has the best of Central Ontario within minutes. 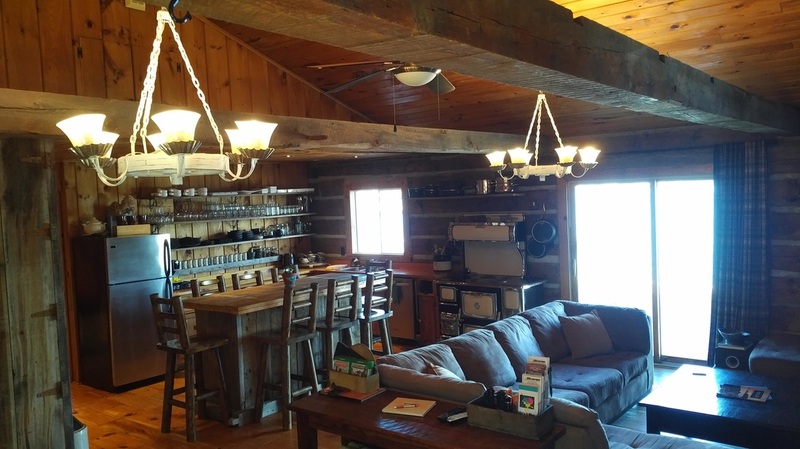 This pioneer log cabin or rental cottage has an open concept kitchen, dining area, living room with 60 inch plasma TV a massive stone, gas fireplace and two pull out sectional couches for all of your family and friends. This cabin also has 2 bathrooms, both bedrooms come with with a queen beds while living room has two pull out queen beds. A propane bbq is provided as well. A swan who likes to visit the dock in the early mornings at the cabin. Sitting on the deck in the evening can be one of the most relaxing and tranquil events at LogCabinRental.ca. Listen to the waves gently rolling in. Here at the Log Cabin rental - Sit on the back deck and listen to the soothing call of the loons, roast marshmallows in the outdoor fire pit, or turn up the music on the outdoor speakers and enjoy your time with friends and family. Want to do some deep lake salmon fishing, or run the shoals looking for large bass. Have a few jet ski's and want the ready to go all week long...Here is the most useful dock for you boat at a rental Log Cabin or cottage in Ontario.